Happy equinox: welcome to autumn! 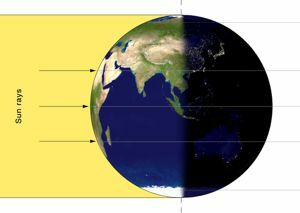 www.earthsky.org reports: The super Harvest Moon and Mid-Autumn Festival of September 8-9 are early in 2014, but September equinox isn’t until September 23 at 2:29 UTC. Although the equinox happens at the same moment worldwide, the clock times vary by time zone. Where should I look to see signs of the equinox in nature? Does the sun rise due east and set due west at the equinox? What is an equinox? The earliest humans spent more time outside than we do. They used the sky as both clock and calendar. 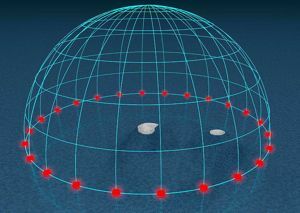 They could easily see that the sun’s path across the sky, the length of daylight, and the location of the sunrise and sunset all shift in a regular way throughout the year. Our ancestors built the first observatories to track the sun’s progress. 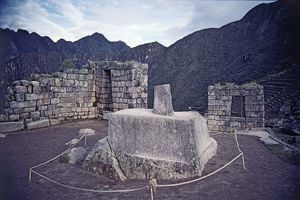 One example is at Machu Picchu in Peru, where the Intihuatana stone, shown at right, has been shown to be a precise indicator of the date of the two equinoxes and other significant celestial periods. The word Intihuatana, by the way, literally means for tying the sun. Today, we know each equinox and solstice is an astronomical event, caused by Earth’s tilt on its axis and ceaseless orbit around the sun. Because Earth doesn’t orbit upright, but is instead tilted on its axis by 23-and-a-half degrees, Earth’s Northern and Southern Hemispheres trade places in receiving the sun’s light and warmth most directly. We have an equinox twice a year — spring and fall — when the tilt of the Earth’s axis and Earth’s orbit around the sun combine in such a way that the axis is inclined neither away from nor toward the sun. Earth’s two hemispheres are receiving the sun’s rays equally now. Night and day are approximately equal in length. The name ‘equinox’ comes from the Latin aequus (equal) and nox (night). Image credit: Przemyslaw Idzkiewicz. Why aren’t day and night equal on the day of the equinox? But, since Earth never stops moving around the sun, these days of approximately equal sunlight and night will change quickly. Where should I look to see signs of the equinox in nature? The knowledge that summer is gone — and winter is coming — is everywhere now, on the northern half of Earth’s globe. If you live in the Northern Hemisphere, you can easily notice the later dawns and earlier sunsets. Also notice the arc of the sun across the sky each day. You’ll find it’s shifting toward the south. Birds and butterflies are migrating southward, too, along with the path of the sun. The shorter days are bringing cooler weather. A chill is in the air. In New York City and other fashionable places, people have stopped wearing white. Creatures of the wild are putting on their winter coats. All around us, trees and plants are ending this year’s cycle of growth. Perhaps they are responding with glorious autumn leaves, or a last burst of bloom before winter comes. In the night sky, Fomalhaut — the Autumn Star — is making its way across the heavens each night. Does the sun rise due east and set due west at the equinox? Generally speaking, yes, it does. And that’s true no matter where you live on Earth, because we all see the same sky. No matter where you are on Earth, you have a due east and due west point on your horizon. That point marks the intersection of your horizon with the celestial equator — the imaginary line above the true equator of the Earth. At the equinoxes, the sun appears overhead at noon as seen from Earth’s equator, as the illustration at right shows. This illustration (which is by Tau’olunga ) shows the sun’s location on the celestial equator, every hour, on the day of the equinox. This fact makes the day of an equinox a good day for finding due east and due west from your yard or other favorite site for watching the sky. Just go outside around sunset or sunrise and notice the location of the sun on the horizon with respect to familiar landmarks. If you do this, you’ll be able to use those landmarks to find those cardinal directions in the weeks and months ahead, long after Earth has moved on in its orbit around the sun, carrying the sunrise and sunset points southward. So enjoy the 2014 equinox — September 22 or 23 depending on your time zone — a seasonal signpost in Earth’s orbit around the sun!